2. Slice the apples with a mandolin and let them marinate with the lemon juice, cinnamon, nutmeg, ginger and coconut or maple syrup for 30 minutes. 3. Drain the pie crust nuts, then combine in a food processor with the dates, vanilla and cinnamon. Pulse until it sticks together and is fine. Use coconut oil to coat your pan, then mold the pie crust and put it in the freezer for 20 minutes. 4. 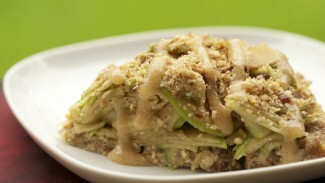 For the topping, put the hazelnuts, cashews, quinoa and cranberries into a food processor and pulse until fine.